The relevant episode in the film is called i Giocatori (the Players—in this case, the Card Players). It features a pompous Neapolitan aristocrat addicted to the Neapolitan card game, Scopa, and his attempts to beat his doorman’s eight-year-old son at the game. Director De Sica also plays the part of the aristocrat (one of those persons in Naples whom Mark Twain referred to in The Innocents Abroad as “princes who live up seven flights of stairs and don’t own any principalities”) and is magnificent in his escalating frustration and rage as he loses hand after hand to the boy. “That’s blind luck! LUCK!” he cries. “No,” answers the boy, boredly. “I just know how to play,” which comment sets off yet another round of purple apoplexy in his opponent. The entire joy in the episode comes from watching Kid clean out Aristocrat—and then watching Aristocrat make an appointment for the next game. A Neapolitan deck has only 40 cards with no numbers printed on them; there are just suit icons for the numbers, ranging from Ace (1) through 7 plus three face cards. 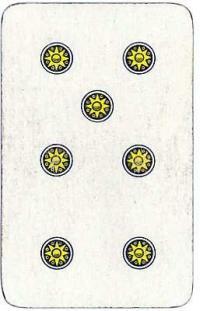 The suits are denari (coins), coppe (cups), spade (swords), and bastoni (clubs). 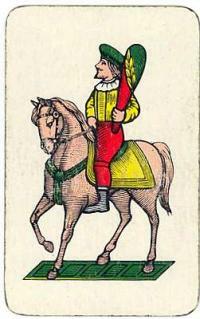 The three face cards in each suit are fante (knave, value of 8), cavallo ( knight, 9) and re (king, 10). To determine the face value of any numeric card, you count the suit icons on the card. Scopa is a “trick taking” game. To start, three cards are dealt to each player with 4 cards face up between the players as the trick-pile. You then use cards from your hand to take cards (and points for later scoring) from the trick-pile. You do this by matching one of your cards to one in the trick, or to the sum of two or more cards in the trick-pile, or by “sweeping” all of the cards in the trick-pile. (Scopa means “broom” in Italian.) If you do that, you are entitled to crow “scopa!” and infuriate the duke sitting across from you. The cards that you take are moved to your own personal "point pile." When both players (or all 3 or 4) have depleted their hands, everyone gets three new cards until the deck is exhausted at which point the score is totalled. 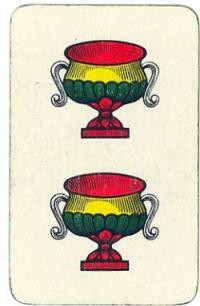 Points are awarded on the basis of (1) how many cards you manage to sweep from the face-up cards, (2) how many times you get “scopa,”(3) whether you have special cards such as the “seven of coin” (known as settebello—beautiful seven), and (4) a bizarrely complicated calculation called the "prime," that is, how many 7's you have—but not only. It's much like "calculate your preadjusted non-deductibles but subtracting line 8 from line 7 and multiplying that by the pro-rated post-deductible allowance per paragraph 4, section 3, unless you are not filing separately." I let the cleaning lady calculate our points. She wound up with 12,538 points. I had eleven. There. That’s all I know, except that you usually play for money. There are a number of variations of scopa about which I know absolutely nothing, except that one of them, lo scopone scientifico, inspired another film, a 1972 film of that name directed by Luigi Comencini. It starred Bette Davis, Joseph Cotton, Alberto Sordi, and Silva Mangano. Davis plays an elderly and totally unsympathetic American millionairess who journeys to Rome each year to play this version of scopa with destitute Peppino (Sordi) and his wife Antonia (Mangano). She inevitably cleans them out, ruining the couple's dream of improving their lot in life. I haven’t seen the film recently, but I recall that their daughter takes revenge by poisoning the old lady. Hmmmm.